As the only listed pipe manufacturer in the country, Crown Asia Chemicals has a lot of leverage as it pursues dominance in the local market. The recent manufacturing boom—towering condominiums, rise of public-private partnership projects, and the surge of investors—gives the company the hope that it is on track to local dominance. “More buildings mean more wires and more wires mean more pipes. As the construction industry grows, it will use more of our pipes,” Tita Villanueva, vice president of Crown Asia Chemicals said in the July issue of Forbes Philippines. 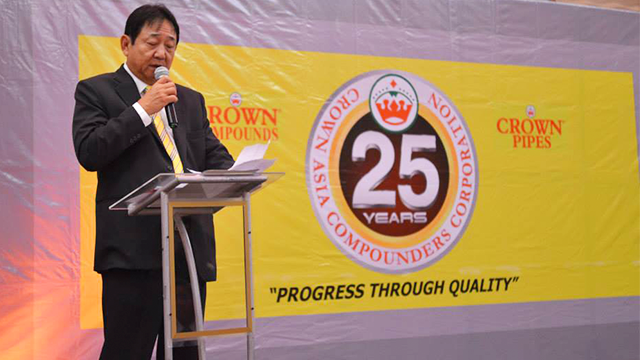 In 1990, with his background in plastic manufacturing, Eugene Lee Villanueva (Tita’s) built Crown Asia Chemicals with one machine and 22 employees. As a former marketing executive of D&L Industries, a plastic manufacturing company, Villanueva had the technical knowhow in the industry. However, he needed a financial arm. He invited Nicasio Perez, his wife’s brother as treasurer. Together with Walter Villanueva, the two families kickstarted the production and sale of PVC (Polyvinyl chloride compound), the third most-widely produced synthetic in the world, to fill the need in local manufacturing. It only took less than a decade for the company to diversify to other products, as it started to manufacture different pipes for electrical, sanitary, and telecommunication applications to name a few, leveraging on its PVC production. Today, these two products are the biggest profit makers of the company. PVC compounds make up 63% of the company’s sales while pipes account for 37%. Since its inception, it has also introduced different types of pipes with its latest offering PPR (polypropylene random) showing promise in the market. The pipe has become a popular alternative to galvanized iron (GI) for homes and buildings with its capacity to withstand strong water pressure and differing temperatures. “The PPR market is huge. It’s like the entire universe. Buildings built 30 years ago used GI pipes. They would have to be replaced,” Eugene said. “This is an opportunity for us to take the lead in this promising market since we’re the only one with our own production. 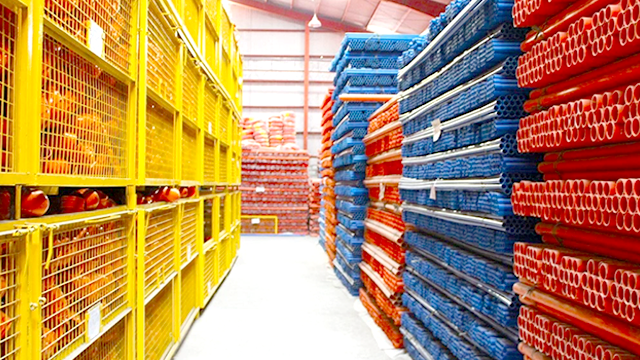 We have been manufacturing since 1997. It’s a good time. We’re stable but we need to grow,” Walter added. The company seems to be on track to this goal after posting consistent gains in the Philippine Stock Exchange since going public in 2015. Its net profit in the first quarter of 2016 alone jumped by 87.2% to P32.2 million ($679.72 million) from the same period in 2015. The surge, ongoing since last year, has been mostly driven by the introduction of PPR and HDPE (high-density polyethylene) pipes in the market. Unlike its competitors who still imports its products, Crown Asia banks on its ability to readily deliver market needs on cue. The company’s new plant in Bulacan is yet to reach its full operating capacity, which is only at 25% as of writing. It hopes to increase that number by 80% by end-2018 as the factory can produce 4,800 tons of PPR pipes and 4,500 tons of HDPE pipes. “Listing the company forced us to do good governance and be conscientious of the way we do things. And that’s part of our IPO (initial public offering). To lead a professionally run company that we can leave to them,” Walter added. Earlier this month, Moody’s Analytics forecasted a strong year for the local manufacturing sector with the strong performance of the domestic economy. With such positive sentiment, it looks Crown Asia will remain as a reliable arm of different industry projects in the pipeline. “I’m sure we’ll be one of the dominant players. Because we know what we’re doing. We know our market and we know where we want to go,” Walter said. Elyssa Christine Lopez is Entrepreneur.com.ph's staff writer. Follow her on Twitter@elyssalopz.